*If you can’t make it every week, you can attend other nights to make up missed classes at no cost. Read More of Emily’s experiences in the Level 1 Course. Have you considered trying an actual meditation course? It will give you the best shot at overcoming the reasons people don’t develop a regular practice. 2. How do I do it regularly? You have likely heard that meditation brings great relaxation, clarity and balance to your life. Then you sit down eager to feel better and all you can remember is that you’re supposed to have no thoughts. Is that even possible? We don’t teach it this way for the simple reason that it drives people crazy at first and then they quit shortly thereafter. The actual goal regarding the mind is to recognize the distinction between you (the one who uses your mind) and the thoughts themselves. You are the witness to your thoughts and the decision maker as to what goes on in there. But for most at the beginning (or even in the middle) of learning to meditate, the mind is using them. The way to change that does take some time and we can teach you how! So as far as what to do to meditate consistently… you will need a process to follow. It can help to sit down and focus on your breathing but spending 20 minutes on that isn’t recommended. It gets boring pretty fast. Instead, we teach a systematic process of relaxing the body, checking in with the mind and then tuning into your emotional state. These are the three expressions of our outer conscious self; body, mind and emotions. We are making room for an inner space where we actually become aware of our soul, believe it or not. Now, as far as keeping the practice going, well that does take work. We teach it as a combination of will power and desire. You’ll have to want to meditate because you have your heart set on the benefits to come. But also at times you’ll need to decide to do it even if you don’t totally feel like it. Think of those times you know you need to go to the gym but you don’t really want to. After a little internal battle, you go, right? Same principle applies to meditation. 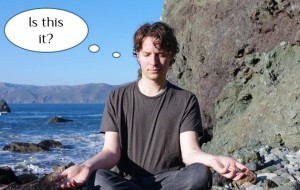 Perhaps you have also heard of TM that teaches a meditation course in your city. Yes, we know about them. We’re all working towards the same goal!